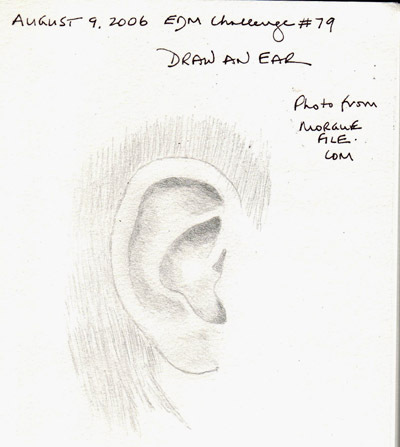 When this challenge was announced, I sketched an ear in pencil because I lacked the skills to paint it in watercolor. Then I decided to take photos of each of my grandchildren and practice. 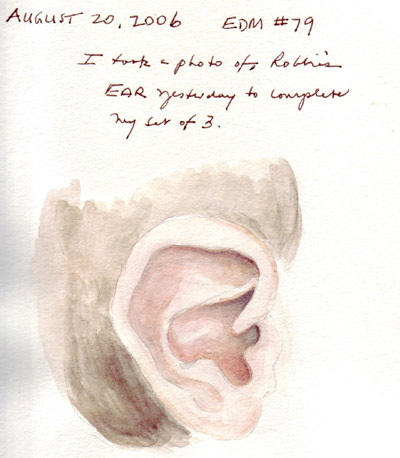 The ear on the left is Robbies and it was painted in a Super Aquabee. 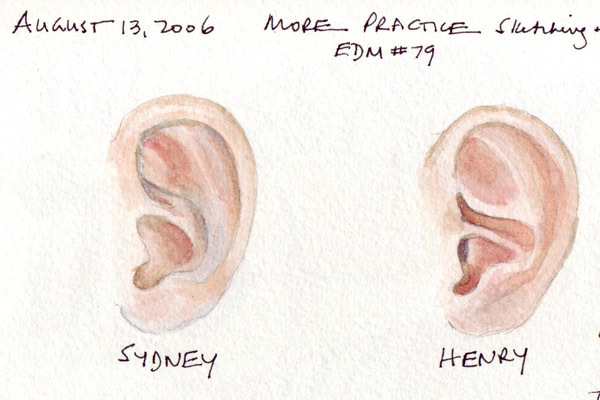 The two on the right were painted in a Moleskine watercolor journal. It is definitely easier to scan the Moleskine. I used alizarin crimson, winsor lemon, burnt umber and Payne's gray. This week I've been trying to think about EDM challenge #80 - what makes me happy? I'm thrilled when I am with all of our adult children, their spouses, and our growing group of grandchildren. 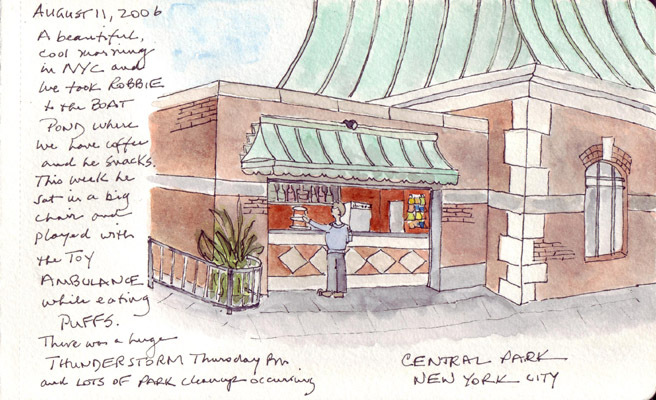 We take care of our youngest grandchild Robbie on Friday and last Friday I posted a sketch from the Central Park Boat Pond Cafe - done while he sat with us for an hour. Our London-based grandchildren then spent the weekend with us (an absolute joy for my husband and I) and Saturday morning we watched the penguins and seals being fed and the Widelife theater play at the Central Park Zoo. 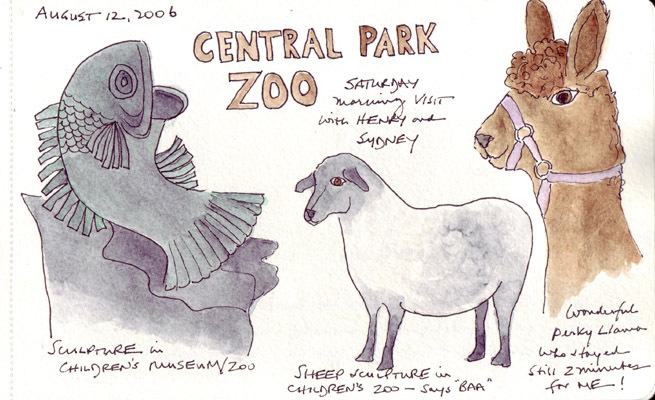 I did these sketches very quickly in the Petting Zoo area - the first two are the large sculptures along the pathway and the 3rd sketch was the perky little LIVE llama that seemed to be saying "I'm the cutest - sketch me!" And then stayed still for 2 minutes for me! There was lots of discussion about Moleskines this week among the EDM messages. 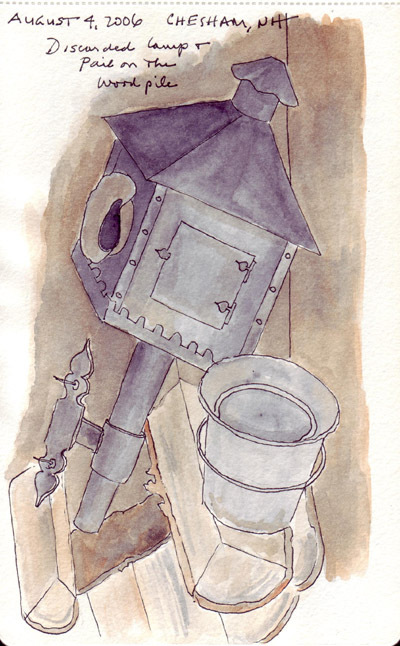 I HATE the format for the watercolor journal, but I do like the paper and I love how it scans. I finally became comfortable with using more than one journal at a time and next will try an RKB Fat Pad with Fabriano 5 watercolor paper that I bought in London. However, this is risky because they don't appear to have a US distributor. My husband and I take care of our youngest grandchild on Fridays and when weather permits, love to walk him in his stroller to the Boat Pond Cafe in Central Park. It is just opening most Fridays when we arrive to get our coffee. This week Park crews had heavy equipment cleaning up mud debris from the Thursday evening thunderstorms. My grandson, who turned 1 at the end of July, had a wonderful time sitting in one of the big chairs with us, eating snacks, and watching the bright yellow vehicles moving around the walkways. Moleskine watercolor journal, Pigma micron pens, and mostly Winsor-Newton tube paints. The base layer of paint copper roof and awning were done with Daler-Rowney viridian from my cylinder travel set. This sketch was made from a photo from Morguefile.com because I didn't have any live models when I returned from work tonight. I rarely use pencil, but don't know how to shade well in pen and can't make convincing skin tones in watercolor. I think I might make lots more ears this week and try to work on some of these deficiencies. I have great difficulty using new journals and work best in my inexpensive spiral Aquabee. I shared my journal angst here previously on several occasions and this Moleskine actually was carried back and forth to Washington DC without a mark being entered. Since then I successfully used a Cachet linen watercolor journal while in London - and forced myself to take the Moleskine on a weekend trip to Chesham NH so I would have to use it for my daily sketch.